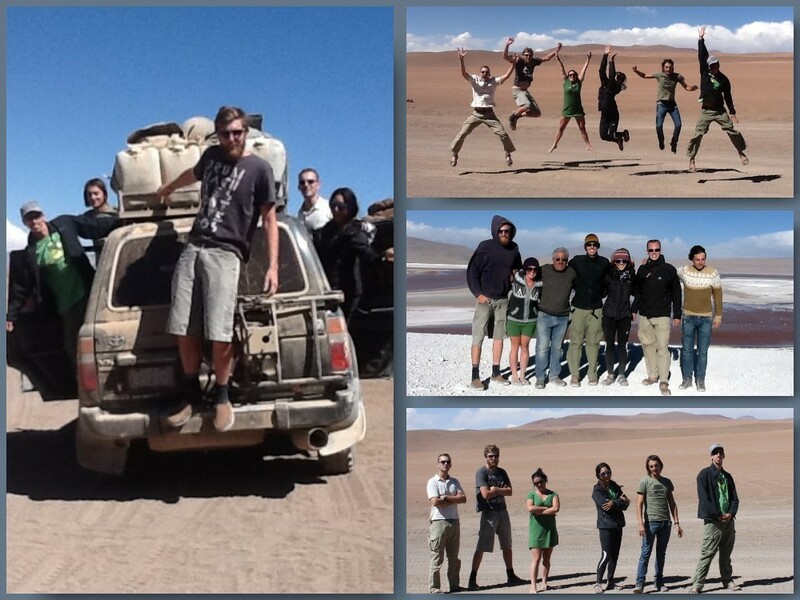 All the travelers we had encountered advised us to get in and out of Uyuni as quickly as possible. A desert town with wide streets to match the open sky, Uyuni was actually more charming than we were expecting (cheers for low expectations). We found the local candy shop and a row of local joints grilling chorizo, llama and beef. We were looking forward to meeting back up with friends from Lobitos, Tash and Nick as well as our Italian friend, Luca. 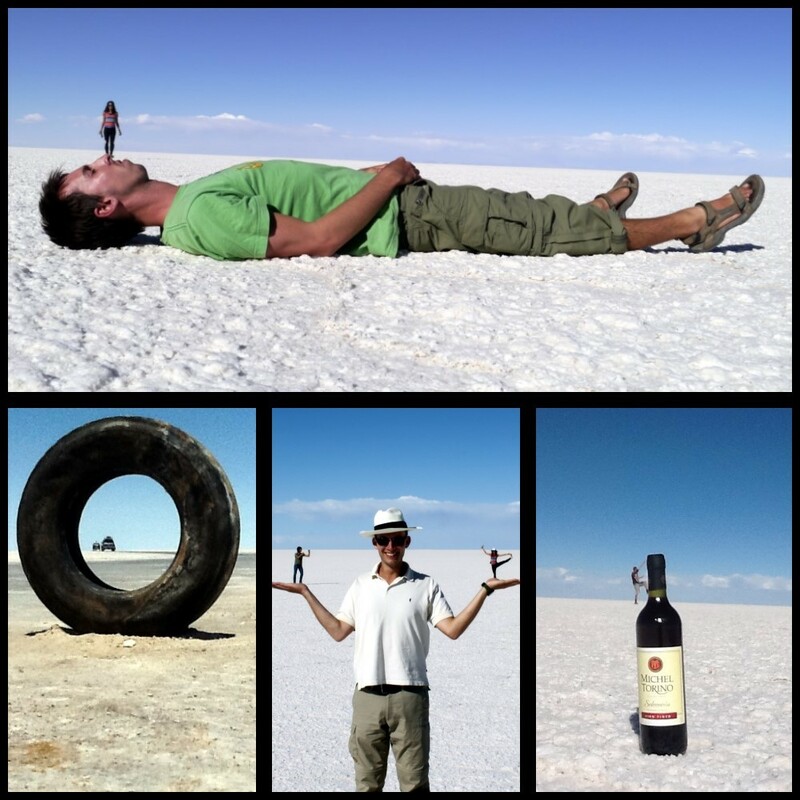 Luca met George on the bus to Uyuni; with George, our Uyuni tour group of 6 was complete! 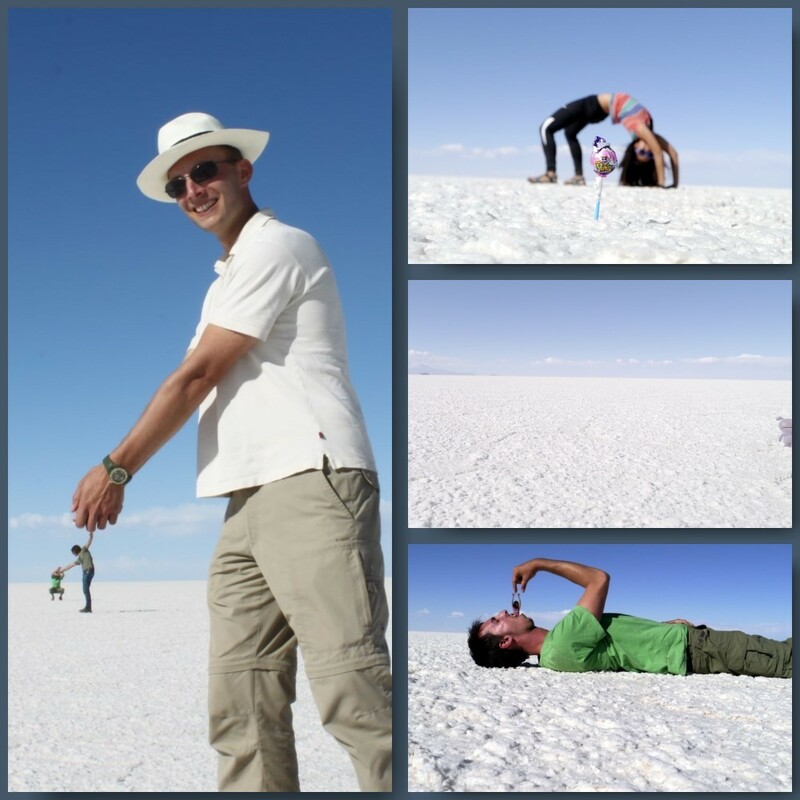 Each street is lleno (filled) with different Salar de Uyuni tour companies. We went to speak to a few agencies – all tours offer identical itineraries and hand-written accolades fill their walls. The difference lies in the condition of the vehicles, driver safety and quality of food. We ended up picking Tito’s Tours because he seemed the most flexible and open to accommodating the needs of our group. His tours go to an extra island that most do not and he let us dictate the departure time (we preferred to leave earlier, as we saw some groups were still loading up at 11AM). 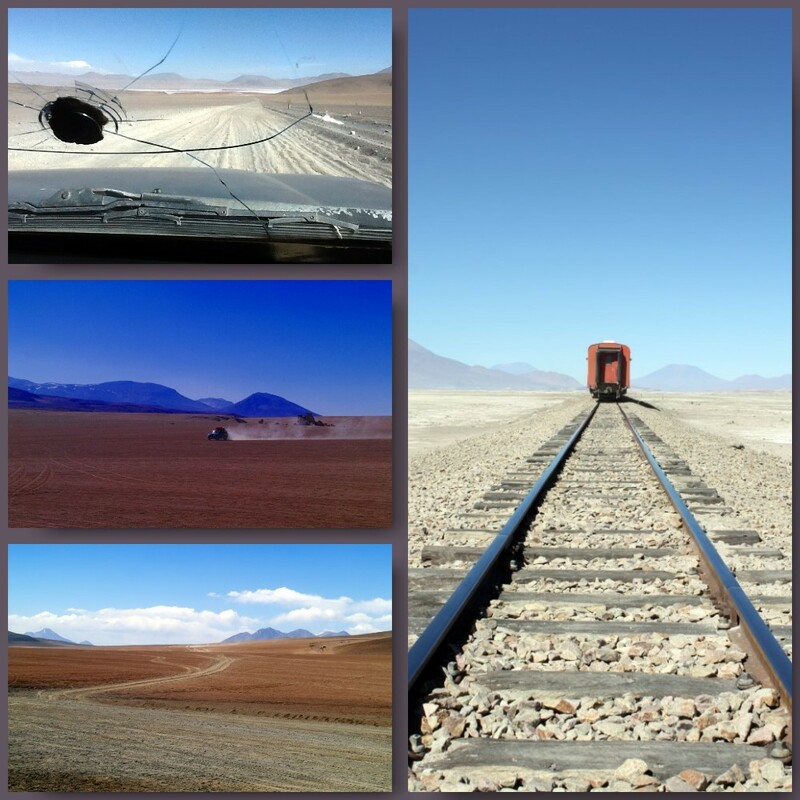 The train used to go between Chile and Bolivia carrying minerals in the late 18th and early 19th century. 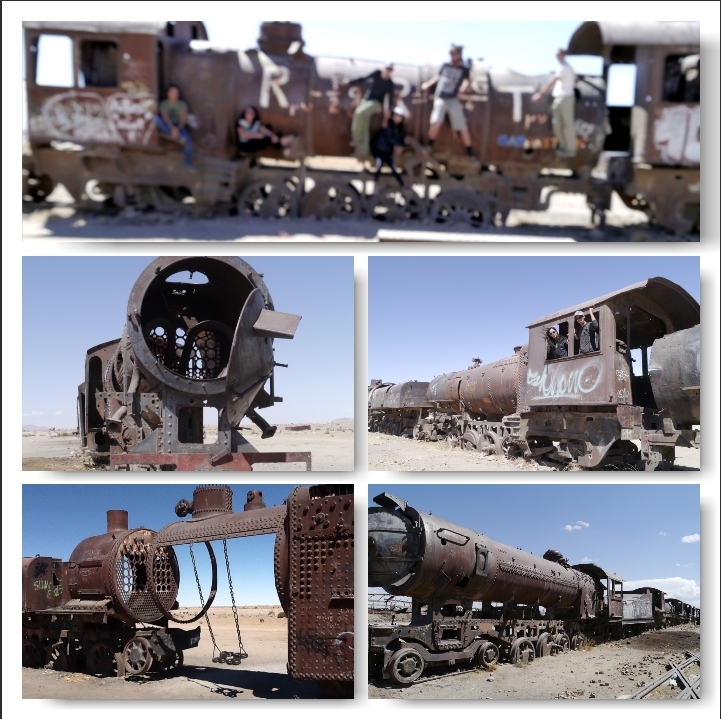 We were one of the first groups on site – we explored the abandoned trains and took our first group photo, the Spicy Chilitos were born! 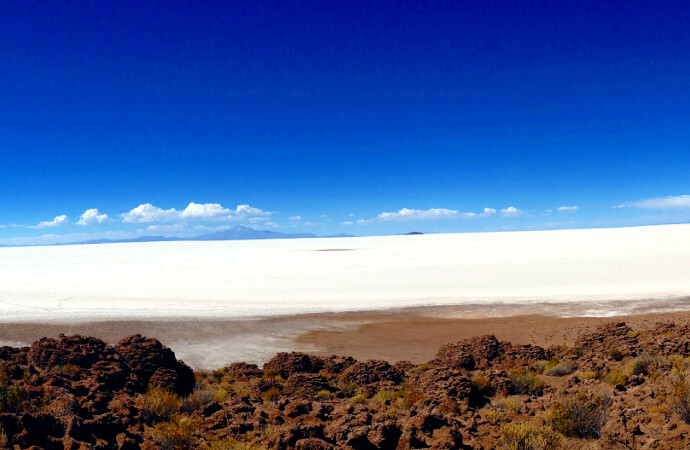 It was another hour drive and a short stop at a tourist trap before we arrived at the edge of the salt flats. At first it was a little underwhelming, the salt was a tan color, matching the endless desert sands, and only broken up by small mounds the locals had created to harvest the salt. 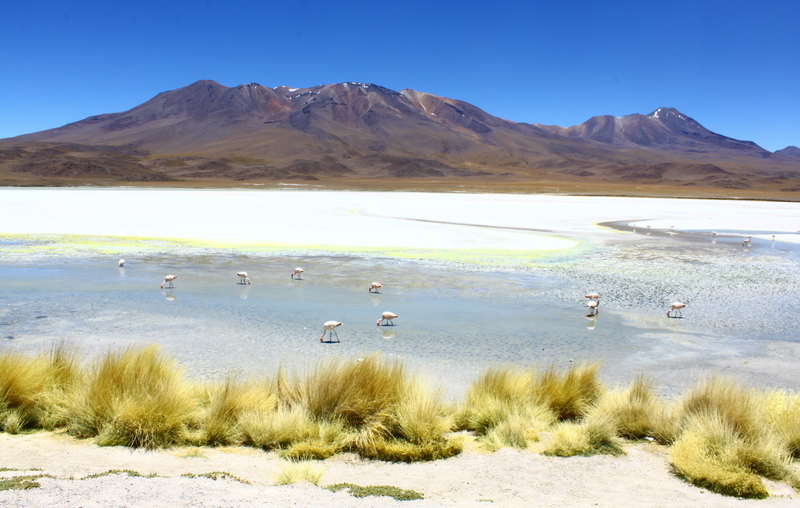 As we drove through the salt, our guide Juan explained the history, size and depth of the salt flats (area over 10,000 sq km and 10 meters thick). As we arrived to the ‘original’ Salt Hotel, the engine began to stutter and stall. While the others were taking pictures of all the country’s flags flying outside the Salt Hotel (the US flag was noticeably absent – Bolivia and the US don’t have the best of relations), Juan and Matt diagnosed the car issue as a stopped up fuel filter. Since the salt desert has zero auto parts stores, the next best thing was to bang on it and hope for the best. Onward to Isla de los Pescados, an ancient coral reef, now a cactus covered rock outcropping from the endless sea of salt. From the top of the island, we digested our delicious lunch and enamored over how magnificent the white plain was, only disrupted by the mountainous volcanoes on the horizon. 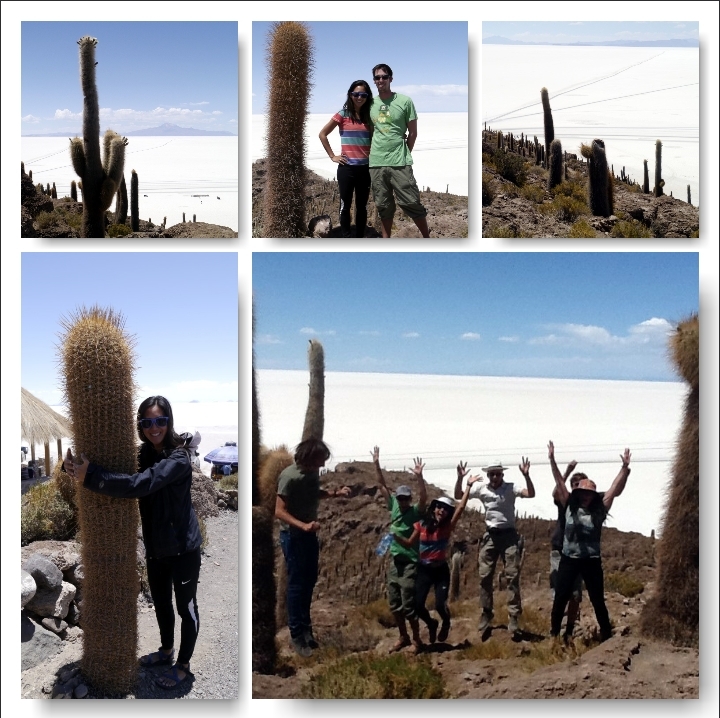 After one more stop at another coral island, we were ready to take the infamous Salar de Uyuni pictures. 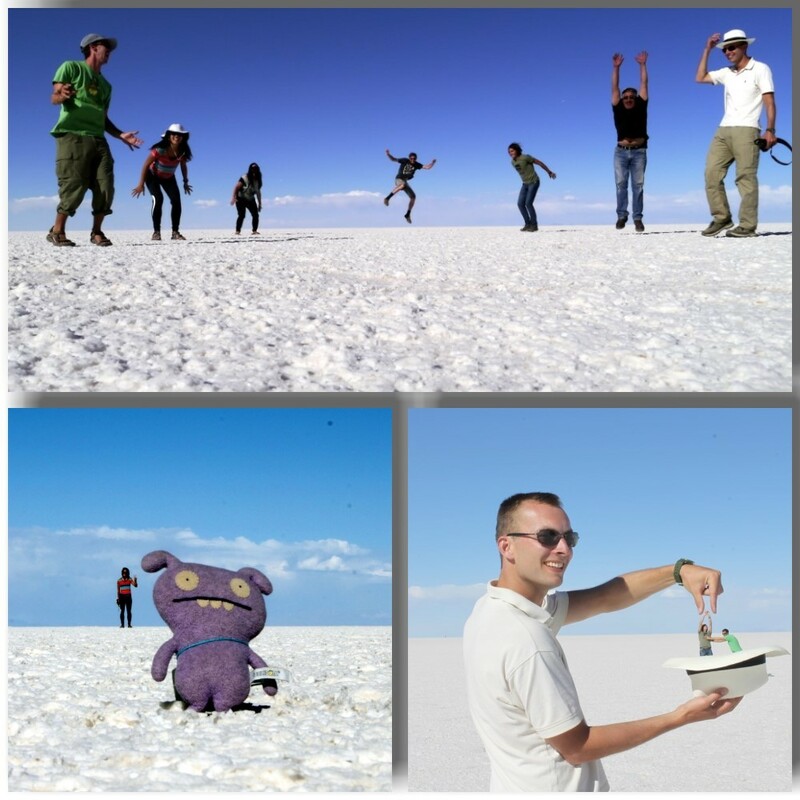 Prior to the trip, we had seen cheesy photos taken on the salt flats, however it took Tash’s and Georges’ explanations to understand how crazed some people get about these pictures. They had been planning some poses for months and had met others who were stocking up on ‘props’ just for this photo shoot. As you can see, the endless white backdrop is perfect for some very fun photography. That night we slept in our very own salt hotel, which was much cleaner and comfortable than it sounded at first. We played some Australian drinking games – which they always seemed to win – and drank some not very good, but very cheap wine (we were so looking forward to the fine wines of Chile). 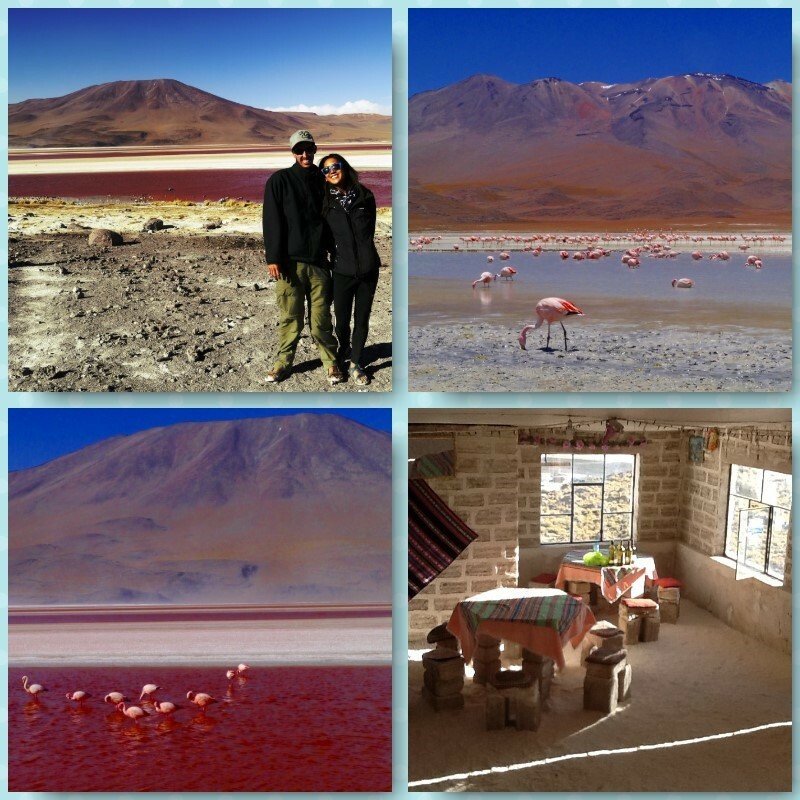 The second day of the tour included stops at several flamingo-filled mountain lagunas of various colors. It was interesting seeing pink flamingos so high up in the mountains, as we had always grown up assuming they were tropical beach birds. 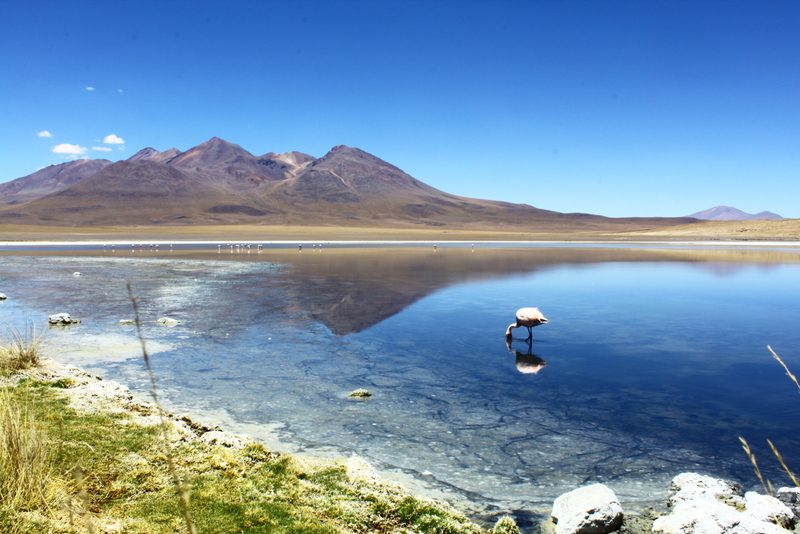 Each laguna we visited had its own unique color, either due to the presence of a specific algae or mineral. That night we slept in a simple hostel and continued our losing streak in drinking games. The final day or the tour we woke up very early to make it to the Solar de Manaña geyser basin. The geysers are no Yellowstone, however there are also no barriers preventing you from getting very up close and personal. We had read about a few people falling in when the sides would cave in and getting serious burns, so we resisted the temptation to trample too far into the bubbling pits. After a refreshing stop at a small hot springs (there had been no showers since the beginning of the tour) it was off the final Laguna, Laguna Verde. After one last group picture, it was to the Chilean border. 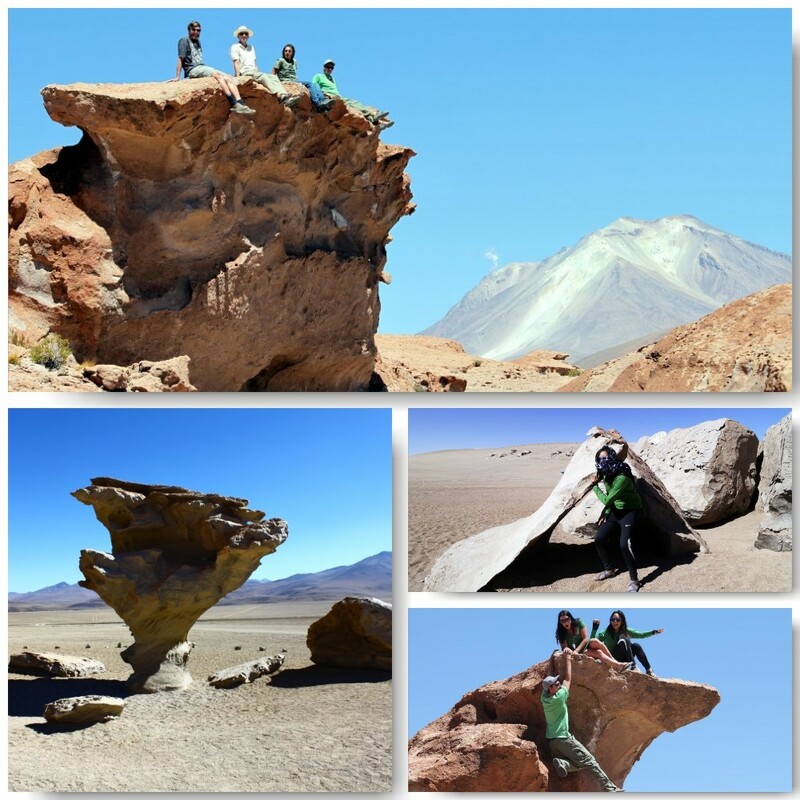 Luca and George would be joining us in San Pedro de Atacama, while Tash and Nish would be returning to Uyuni to head toward Paraguay. individual stuffs great. Always maintain it up!